It is indeed a privilege for me to be present on this occasion and to participate in this programme of National Innovation Foundation, which is being celebrated to recognize the achievements of grassroots innovators. At the outset, I compliment the National Innovation Foundation. The India story of social transformation is slowly unfolding. In this decade of innovation, every sector needs prudent solutions to persistent problems. The achievements of the National Innovation Foundation (NIF) over the last decade, based on the voluntary contribution of thousands of Honey Bee Network members are creditable. Reaching out to different villages through Shodh Yatras, a new idiom of social connectivity has been achieved at the grassroots level. Recognizing creative people at their doorsteps sends a message that the country cares for the rich knowledge of otherwise less- known people. I am particularly happy that in the 7th Biennial Awards there are innovators from all parts of the country. There are children and there are also older people. Obviously, innovative solutions can be found at any age. But if we start early, we can make a much bigger impact over a life-time. I suggest that NIF organizes workshops for creative children who are awarded every year to help them understand and meet the social challenges in their lives. Their creativity and inquisitiveness has to be harnessed for larger social good. School and college textbooks should also have a few lessons based on the life of grassroots innovators and innovative children. Among the various weak links in the value chain around grassroots innovations, the absence of community fabrication workshops and laboratories is a major gap. The effort by NIF to provide basic fabrication facilities to grassroots innovators in the form of 27 community workshops in 13 States, including one in Jammu and Kashmir and seven in the North-Eastern States, is laudable. Conversion of an idea into a prototype is an important stage in any incubation cycle. Such fabrication support near an innovator’s place would reduce his transaction costs considerably and help the transformation of an idea into reality. There are many examples of innovations being recognized this year, which demonstrate an ability of grassroots innovators to develop robust, frugal and efficient solutions to local problems such as bamboo processing machines, and multipurpose herbal processing machine for fruits and herbs. They not only trigger entrepreneurial opportunities for the innovators but also generate sustainable livelihood options for the users. Various developmental programmes should encourage field trials of such innovations to expand livelihood opportunities in the country. NIF should take up innovative and socially useful technologies under the Grassroots Technological Innovation Acquisition Fund and get them licensed at low cost or no cost to entrepreneurs in different parts of the country. It must be ensured that the benefits reach the masses as early as possible. The social media tools can also be leveraged to spread the reach of socially useful technologies at no additional cost. I realize that unless financial support is available at an early stage of risky innovative ventures, the aspirations of thousands of creative people will remain unfilled. We have to collectively ensure that no idea remains unattended for want of sufficient support. Unless NIF begins with the incubation of two to three thousand ideas, it will not get those few hundred potentially viable leads which may eventually generate twenty to thirty breakthroughs in the market place. We need to work collectively to ensure that all potential ideas are exploited in the larger national interest. Recently, while interacting with the Vice Chancellors of Central Universities, I advised them to have a chapter of the National Innovation Club in every University. These clubs should search and spread innovations, sense and identify the problems and celebrate the outstanding achievements in the hinterland. The academic institutions should pay closer attention to the creative potential of our society and try to add value to the grassroots innovations to enable commercial or social diffusion. Such partnerships have to play a crucial role in mobilizing the energy of youth and their faculty guides for making India a truly inclusive society. This link between the formal and informal science will not only help these grassroots technologies to graduate into viable products but also trigger experimental ethic amongst others. Universities can also establish co-creation labs where young students and innovators work together. A small exhibition of various creative ideas from the hinterland will provide a daily spur to young minds and thus challenge their inertia. I am happy that various labs of Indian Council of Medical Research, Council of Scientific and Industrial Research and Indian Council of Agricultural Research are actively supporting the grassroots innovation movement. I call upon the private sector to also take steps in supporting this inclusive innovation movement. The knowledge of women is very crucial in making our society inclusive. We have to recognize, identify and enhance their ability to solve social problems with the support of the formal system. The agricultural growth needs to be accelerated to improve the living conditions of vast majority of people dependent on it. I notice that a large number of innovations recognized by NIF are from this sector. If the departments of agriculture at the central and state level share these ideas, many more farmers, artisans, fishermen and women will be encouraged to experiment. Incentives for scientists, extension workers, public administrators to help in spreading and spawning creative ideas of people for mass or niche applications are essential. Those who help spread the innovations deserve no less recognition than those who develop them. I am told that NIF is also including such officials in the list of partnership awards to create a healthy, synergistic and mutually supportive innovation eco-system in the country. 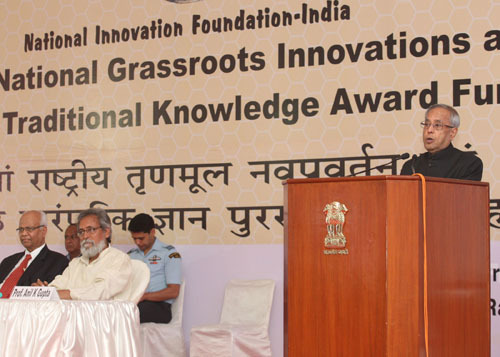 India is perhaps the only country where grassroots innovations are a part of National Innovation System. We have to now institutionalize the culture of innovation at all levels of public administration so that tales of persistent neglect of Indian genius become a matter of past. In future, no creative voice should remain unheard, no innovative mind should remain unengaged and no story of institutional transformation should remain untold to our young generation. In the 150th year of Swami Vivekananda’s birth anniversary, I appeal to the youth to rededicate themselves to make India a creative, collaborative and compassionate society. There are many problems, which have remained unsolved despite all the gains in science and technology. Be it transplantation of paddy, picking of tealeaves, the tools of cobblers, the drudgery of manual head loaders. I am happy that NIF has announced attractive awards to those who can offer innovative and extremely affordable solutions for the purpose. I wish innovators all the success in their future endeavours and hope that they will continue striving for reducing drudgery, improving efficiency, and enhancing the quality of life of the masses without impairing their environment.